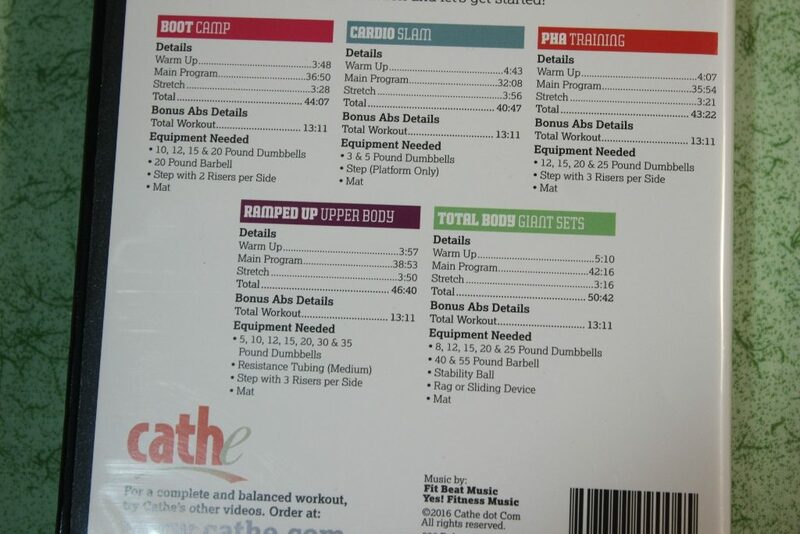 The new Cathe Strong and Sweaty workout set arrived a few days before Christmas – an early Christmas present to myself. I pre-ordered this set back in September. The workouts range in time from 40 minutes to 50 minutes. There are lots of premixes on each dvd that allow you to do shorter versions of the workouts if you don’t have time for the entire workout. I like that feature since some days I just want to do a 30 minute workout and not 45 minutes. So far I have tried the Boot Camp and the Cardio Slam – I used the shorter premix versions since this time of year is busy and I don’t always feel like doing the entire 40 or 50 minutes. I liked both of these workouts and the Cardio Slam really kept my heart pumping and it was fun. I am planning to do the PHA training on Wednesday of this week and Total Body Giant Sets on Friday. The days between I will be doing yoga. There is a one month workout schedule plan for this dvd set and I plan to use that in January – this will be my workout to begin the new year. I hope everyone had a good Christmas and has a Happy New Year! Well, I finally decided to get with the spiralizing craze. I know that spiralizers have been popular for a while now but I was reluctant to buy another gadget that I would have to find room for in my kitchen. After picking up a book from the library about a month ago on spiralizing foods I got motivated to do some research on them and figure out which one would work for me and my needs. 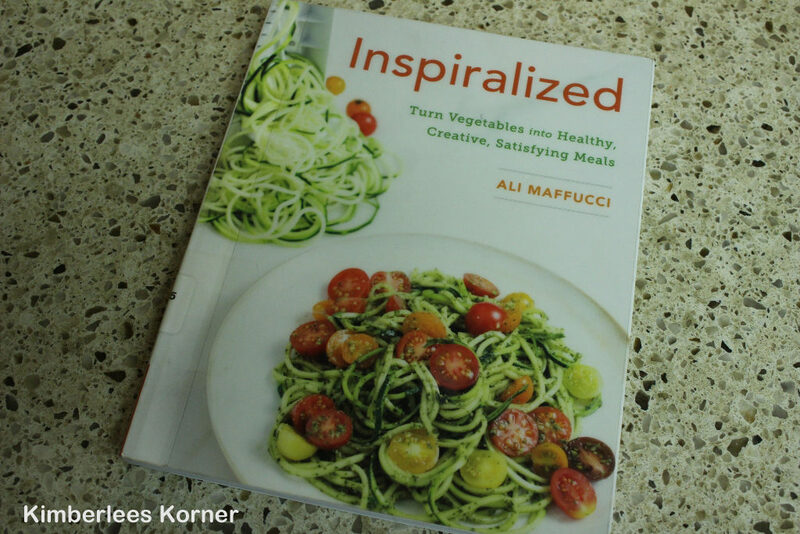 The book I found and really liked a lot of the recipes in was called Inspiralized by Ali Maffucci. So, the book (above) actually inspired me to get my spiralizer. The one I choose to purchase was the attachment for my kitchen aid mixer. I watched a couple of videos on YouTube about the attachment then went to Bed Bath and Beyond with my 20 percent off coupon and bought one. I looked at a couple of other ones that were manual (and cheaper) but this one that operates with the mixer motor seemed like it would be much quicker and easier to spiral certain things like sweet potatoes that are kind of hard. 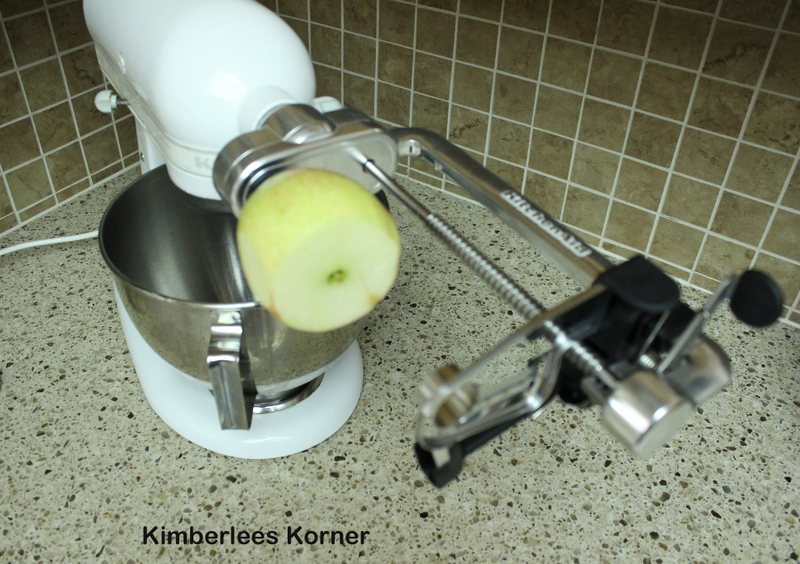 Above is a photo of the attachment – it even has an optional peeler that will peel your fruit or vegetable as it spirals it. The whole thing works really well in my opinion. I have been using it at least 4 or 5 times a week since I bought it about a month ago. This is a really great way to eat more fruits and vegetables. I really like how it spirals everything very uniform and it is fun to cook with zucchini or yellow squash noodles. It also makes fun curly fries – regular or sweet potato – that you can bake in the oven. My husband and I love the sweet potato strings or fries. I have made those a few times now. 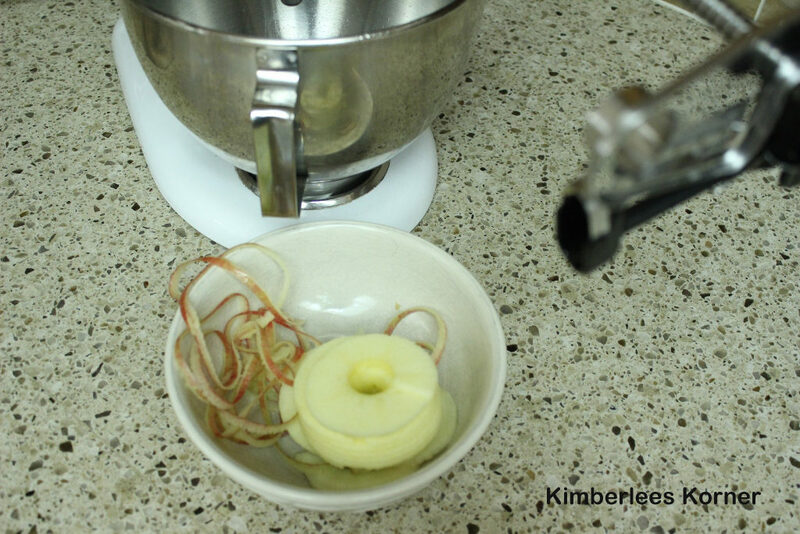 Above photos are of the attachment spiralizing an apple and it will peel it at the same time. This is perfect for apple crisps or pies. Once they are spiraled you just cut them into fourths and use them in your recipe. I have also made a wonderful cranberry applesauce in my crock pot twice and these apple are great for that recipe. There are lots of great recipes on pinterest using spiralizers and you can find several books as well. I found a few books at my local library and have told my son I would like the book Inspiralize Everything by Ali Maffucci for Christmas. I like the recipes in that book a lot and it explains how to spiralize fruits and vegetable from A to Z. I am also taking some of my existing recipes and converting them to use spiraled fruits or veggies – it is a fun way to cook and increase the amount of nutrition in your diet. So, overall I really love this new attachment. If you are thinking of buying one I would recommend it. 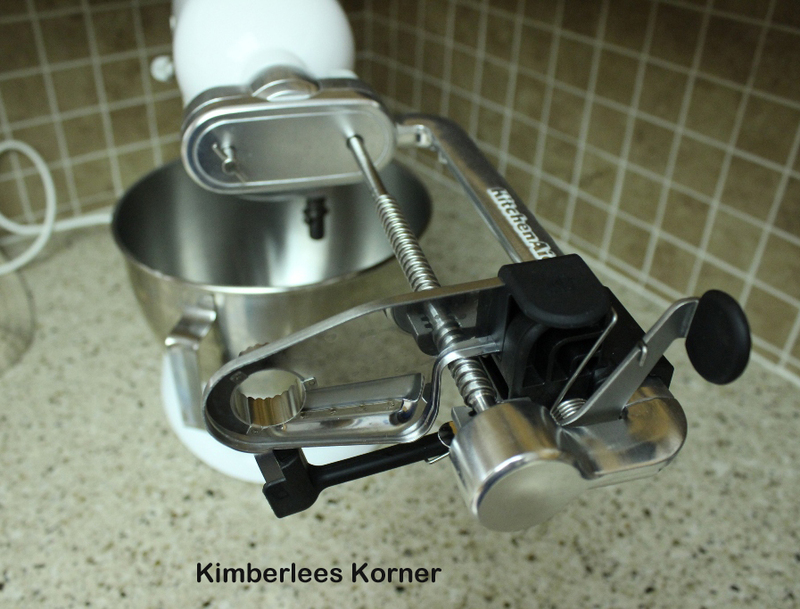 It is easy to use, easy to clean – the 4 blades it comes with are dishwasher safe, the main attachment that goes on the mixer you just wipe off but it really does not even touch the food items that much. Also, it comes in a very nice box that all the pieces fit in and can be stored in a cabinet or your pantry. I hope everyone is having a great December and has a Merry Christmas!